Several endangered species of bird nest in Upper Newport Bay (UNB). Their wetland and upland homes are very delicate and easily damaged. For any further information about what is permissible in the Ecological Reserve, contact the California Department of Fish and Wildlife. For more information about the Nature Preserve, contact the County of Orange, Parks. 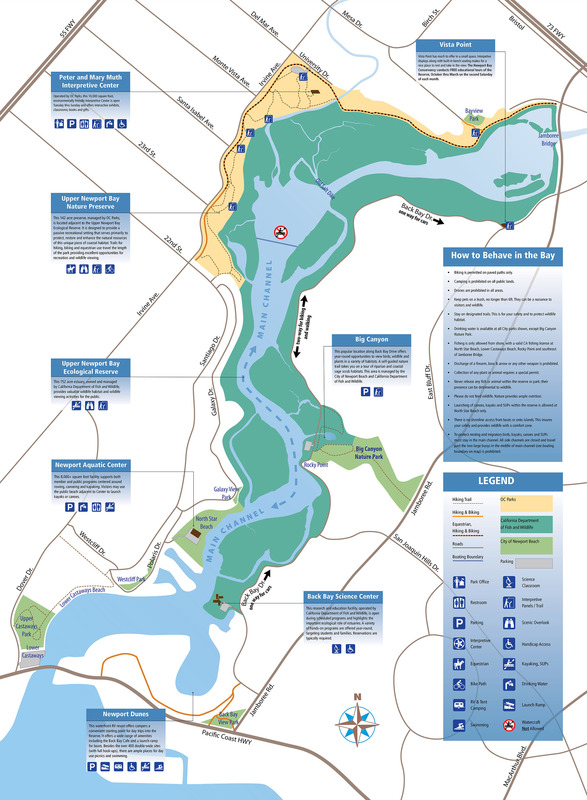 Click on map to enlarge/view of all the designated trails at the Bay. Walk, bike or horseback ride only in established trails, paths and other designated areas. Keep dogs and cats inside vehicles, or on leashes no longer than 6 ft.
Drive or ride motor vehicles and bikes on designated roads and stop or park in designated areas only. 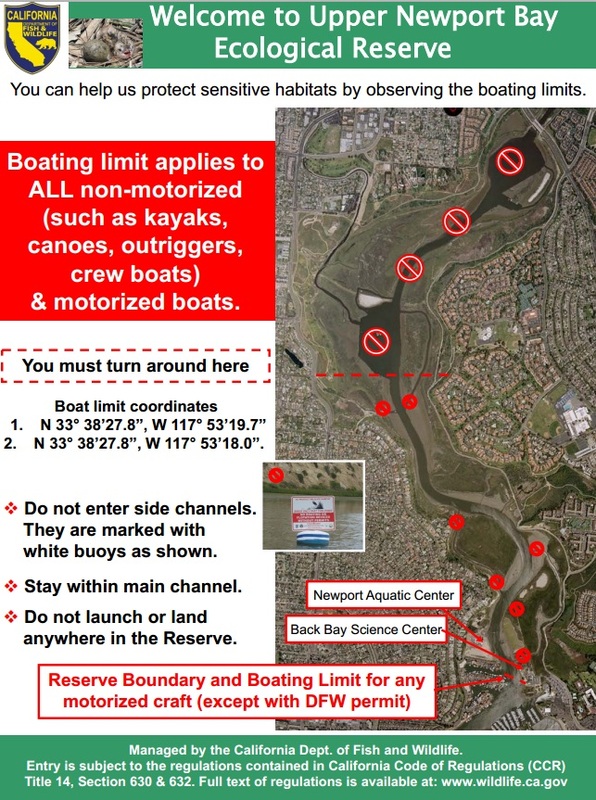 Launch and land non-motorized boats only at designated launch sites at the Newport Dunes or the Newport Aquatic Center at North Star Beach. Fish* from the shore at North Star Beach, the rocky outcrop between San Joaquin Hills Rd. and Big Canyon, or at the Jamboree Road bridge. Commercial fishing is not permitted. Swim only at North Star Beach. Feed the wildlife. Feeding birds and animals makes them dependent on humans and entices them into open areas where they are vulnerable to predators. Release any fish or animal, including domestic species, or introduce plants. Disturb any form of plant or animal life: birds, nests or eggs, plants, mammals, fish, mollusks, crustaceans, amphibians, or reptiles. Collect specimens unless you have a special Upper Newport Bay permit from the Fish and Wildlife Commission and a scientific collecting permit. Fire or discharge any firearm, bow and arrow, air or gas gun or any other weapon. Walk on the mudflats. You can and will get stuck. Land any craft on any island or shore of the Bay. Boat, canoe, or kayak in any side channel of the Bay or beyond the posted boating limit. No flying of drones or other remote craft. 33° 39.03’ N. lat. 117° 52.01’ W. long. (B) Take of all living marine resources is prohibited except the recreational take of finfish [subsection 632(a)(2)] by hook and line from shore only, or take pursuant to activities authorized under subsection 632(b)(132)(D), is allowed. *Finfish are defined here as any species of bony fish or cartilaginous fish (sharks, skates and rays).